Nissan unveiled Monday its latest vision for electric vehicles at the North American International Auto Show — the third consecutive year the automaker has teased what its EV future might look like. This time it’s a sleek EV concept called the Nissan IMs, which the automaker describes as an “elevated sports sedan.” If the IMs name sounds familiar, it’s because it is. The name ties in with Nissan Intelligent Mobility (IM, get it), the branding that it uses for its automated technology and electric vehicles. “Fully embracing the three pillars of Nissan Intelligent Mobility — Intelligent Driving, Intelligent Power and Intelligent Integration — the IMs concept moves toward the creation of a sustainable mobile society in the form of EVs, autonomous drive and connectivity technologies,” said Denis Le Vot, senior vice president, chairman of Management Committee, Nissan North America. To be clear, the IMs is a concept. It is not a production vehicle. Nor is the Xmotion that the company showed off last year or the Vmotion in 2017. Instead, these concepts are meant to show what might be on the horizon and gives the industry a sense of where it’s headed. But Nissan says more EV production cars — not just concepts — are coming. Eight to be exact. Le Vot said Monday in Detroit that the automaker will launch an additional seven electric vehicles (following the introduction this month of the Nissan Leaf e+) by 2022. In Nissan’s view, an “elevated sports sedan” is sort of a sedan and sort of a crossover. Call it a hybrid sedan. Or a sedanover; a crossan? The concept vehicle has unusual proportions and sits higher than a classic sedan. The battery is located under the body, which elevates the cabin height. The IMs also has a stretched interior space, thanks to the vehicle’s extended wheelbase, and features pivoting front seats and a rear seat that either offers three-across seating, or, once the slim rear outboard seats are folded, an indulgent “premier seat” in the rear center. Oh, and there are reverse-opening rear doors. The IMs concept is all-wheel drive and powered by dual electric motors located at the front and rear of the vehicle.The vehicle’s electric powertrain generates 483 horsepower and 590 lb-ft of torque, and a 115-kWh battery provides an estimated range of 380 miles on a single charge. It’s also equipped with an advanced air suspension that adapts to different driving situations. Because it’s the future and a concept, the IMs can be switched to full autonomous mode. When this happens, the concept’s headlights and rear combination light turn blue and the lighting travels continuously from front-to-rear to notify pedestrians and other drivers of its autonomous status. 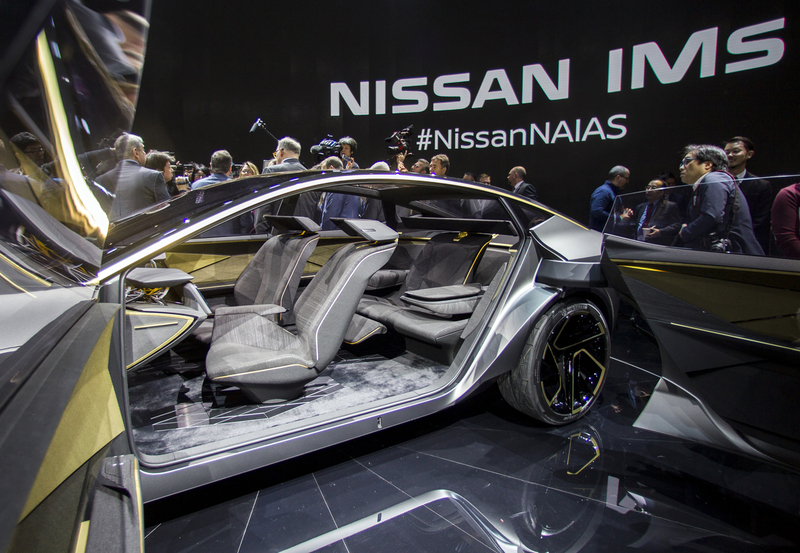 A fully autonomous Nissan IMs isn’t here for customers, nor will it be anytime soon, if ever. But it does intimate the automaker is interested in a vehicle that can be driven by humans and then switched to full automation. Perhaps nearer term is Nissan’s plan to bring virtual reality into the vehicle. Nissan has developed a platform it calls I2V, or Invisible-to-Visible, which is also in the IMs concept. I2V, which is made possible with Omni-Sensing technology that Nissan announced last week at CES, could allow drivers to see around corners and visualize precise information about traffic jams. Drivers may even enjoy the company of a “passenger” from the virtual world in the form of a three-dimensional augmented-reality avatar inside the car, according to Nissan.